Olde Green Cupboard Designs: Where have I been???? 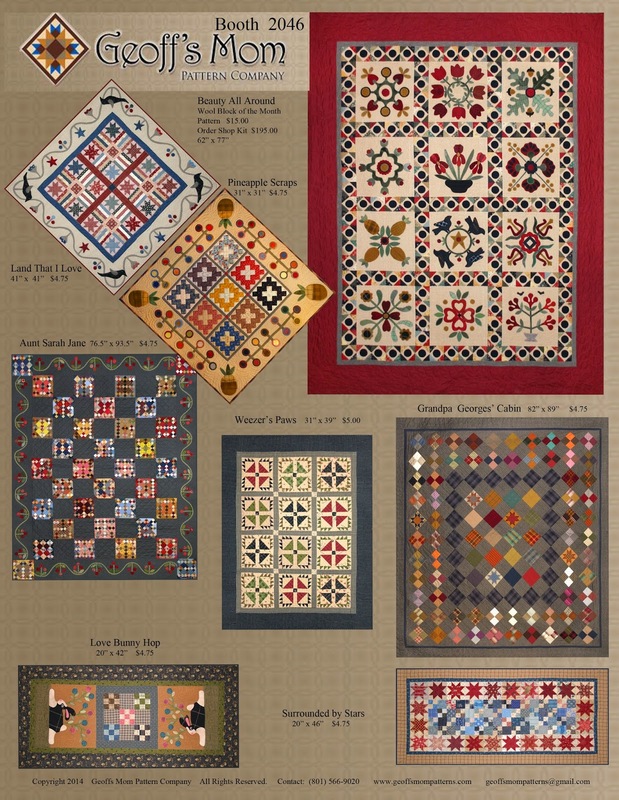 Today I'm headed to Cinnamon's Quilt Shop to facilitate our "Featherweight Club" ! We all enjoy our featherweights and it's great fun to hear the "huuuummmmmm" of them all running in one room. Plus... I'm going to show the gang how to make a zipper bag if they are interested! Beauty All Around (top right corner) is her BOM! It's so much prettier in person... I can't wait to see what the response is from the shop owners. I hope she gets tons of them to sign up! 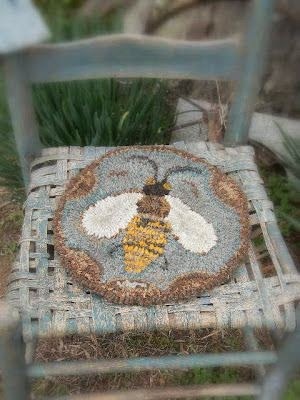 If you are new to wool applique...this is a great one to begin with. Talk to your local shop owners and have them check this out. We will be in booth 2046! The other exciting thing about market is.. we get to see trends in colors, styles, techniques... it's so mind boggling and so wonderful at the same time. After market, we will get the booth set up for festival. I am staying for 2 days just to shop and get inspired. Actually... it's more like mind overload...but I love it...what can I say? 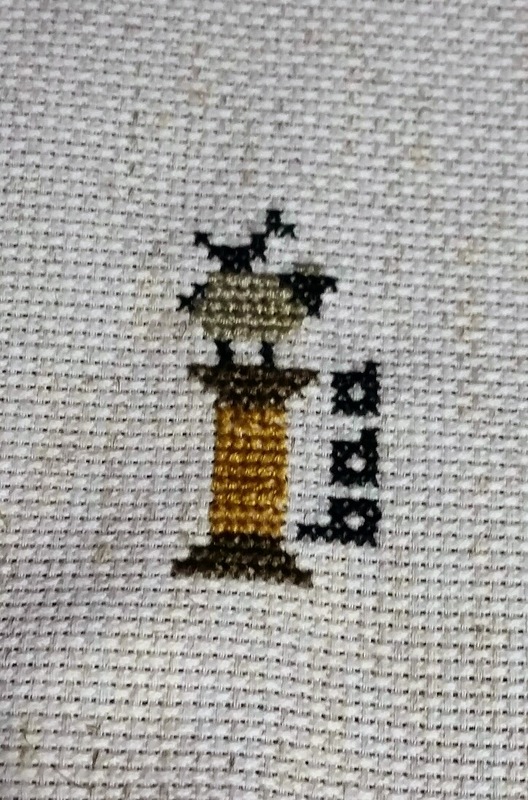 I'm working on two wool BOM myself and let me tell you...it's a TON OF WORK! I have one named (for now) LIVING IN AMERICA... then another one that is all fall.... filled with pumpkins, scarecrow, crows, haystacks, sunflowers, turkey, cats, moon, bats, .... I'm taking it to market with me to see what some of the other designers think of them. Then... picking out fabric that will still be available by the time I'm finished...that's the challenge. Fabric moves in and out so fast (almost like being on Project Runway...One day you're IN... the next day you're OUT! 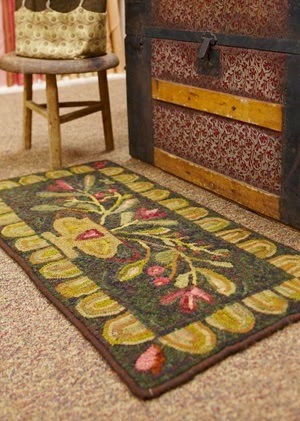 )that it's a great challenge to pick some that will be around long enough for you to get the project sample done! I'm thinking about using those wonderful over dyed muslin and flannels... what do you think? We are still designing for our Ohio Company and loving it. Our Christmas and Halloween products are at the manufacturers NOW and hopefully will have samples ready for the showrooms in January! How fun it will be to see our inspirations LIVE in a room where shop owners can order them. As soon as we can...we'll show you some pictures! Well... I'm off to get packed up for my sewing day! Oh... I almost forgot...I'm making items to sell in Katie Puckett's Off the Ocean Rug Hooking Conference in January. It's in Orange Park at the Marriott hotel and it's going to be so great. If you are interested, you can find it under my retreats (top tab on my HOME page). There is still time to sign up!! Here are some designs that we all hook! 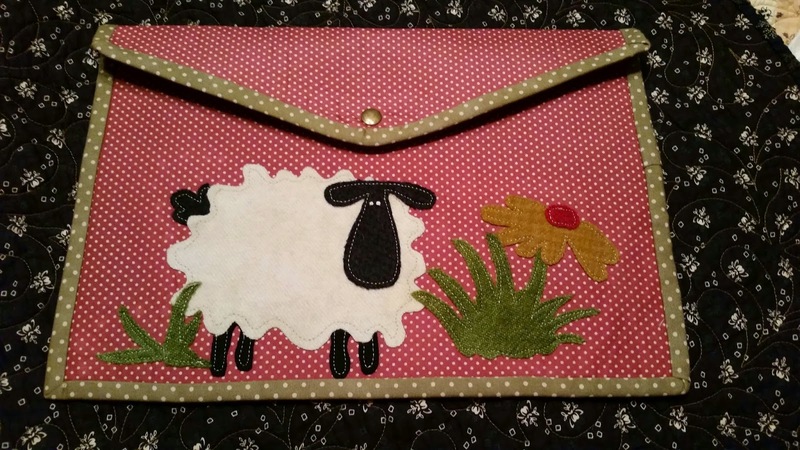 Great fabric envelope to store patterns, notions, etc. This little guy is going to go into something special... it's a surprise! These are also fabric envelopes....this is on the front! 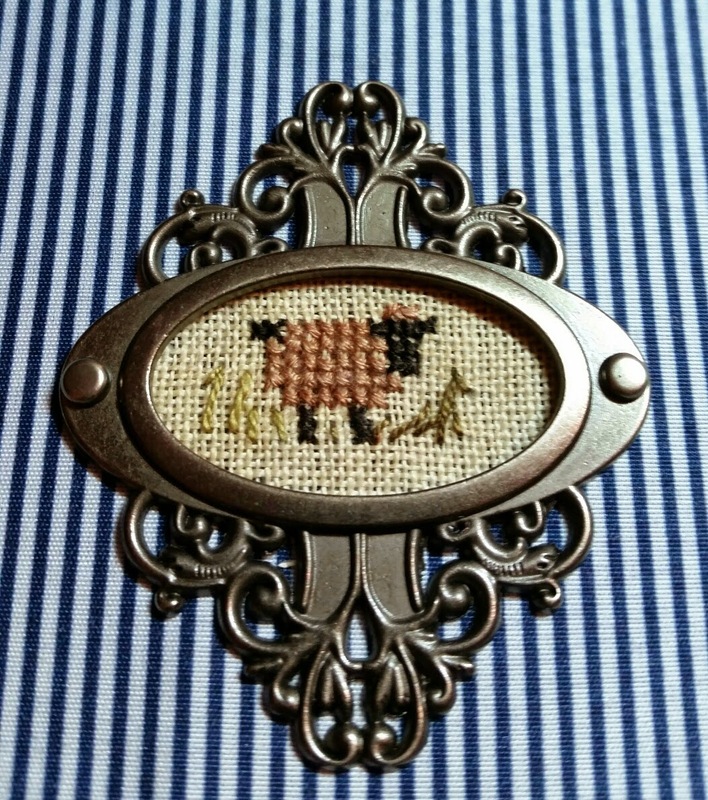 Cross stitched and tucked inside a sweet metal frame that is attached to the front! 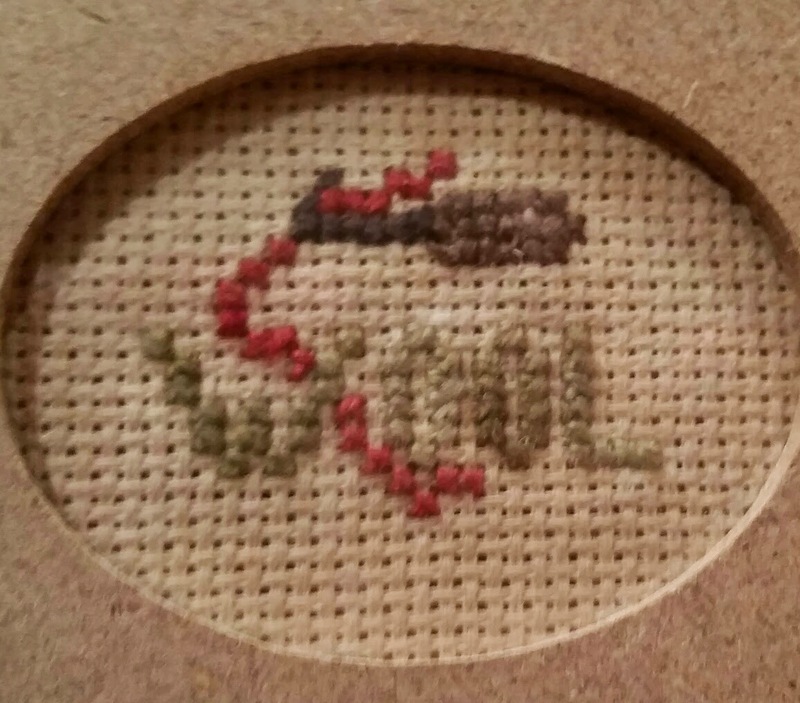 This cross stitch piece is of the Hook and wool! It too will be a surprise what it's going to be! okay... off to sew!!! Stay safe and well!